The market for phone speaker docks has grown exponentially, catering for almost every taste, whether it is an audiophiles dream or a geek’s desirable. So how does a new dock stand out from the crowd? 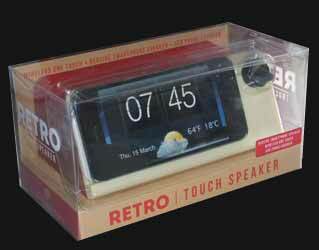 Thumbs Up!’s new Retro Touch Speaker turns your smart phone into an old style flipping display alarm clock. The unit is made of plastic and will fit most smartphones. The unit can be powered by the USB port, cable included, or from 3 x AAA batteries. The output from the speakers weighs in at 2W / 4 Ω / 1.5 RMS from the two inbuilt speakers and its overall dimensions are 15x9x8 cm. The unit boasts of wireless technology to boost the output from your phone. What is really happening is that it picks up the output from your phones speakers and enhances that. This works fine for units from Apple, but for other manufacturers you will have to check the positioning of your own phones speaker. Overall, it has a retro fifties feeling to it, mine was a sort of pink and beige, with a satisfyingly large knob to control the output, indicated by the extraneous increasing swatch of colour, which enlarges as the volume increases. A useless piece of information which once used to appear on all technology. As detailed information it’s not a lot of use, but it does add to the retro feel of the unit. If you are of a mind, you can charge your phone by attaching it to the units USB port, as long as you also attach the unit to another USB, so it can draw power. 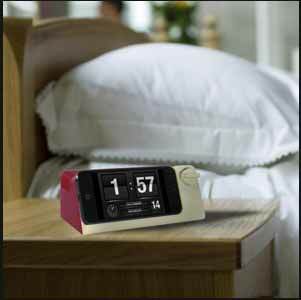 It is easy enough to use and as its primary focus is to remove having both a phone and an alarm clock using energy through the night, it works well. It certainly is loud enough to wake you in the morning. The only down side is that you have to provide your own clock face, an included small app with display options would have made the unit more attractive.